When was the last time you made a difference in someone’s life? When was the last time you told someone something wonderful about them? And not just told them, but wrote it down and handed it to them? I’m not talking about the major stuff. I’m talking about the little things. The little things that can add up to some really big things. I’m in-flight right now. Experiencing some turbulence. It’s just after 7 a.m. and the people in seats around me are fast asleep. One is snoring softly. It really is a beautiful day to fly. And to write. Will arrive in Calgary in about 45 minutes for my first of two connecting flights. Overnight in Toronto, then it’s off to Punta Cana in the Dominican Republic in the morning. This will be my second trip to Awesomeness Fest. I urge you to check out the link for information about this life-altering festival. Last year at this time it was Cancun, Mexico. It’s hard to put into words how Afest impacted me. I’ve thought about that trip countless times since. When you’re among 250 visionaries, masterminds and unlimited creative energy, the vibrational frequency is off the charts. Your own creative juices can't help but flow. “Sugar cubes” are a tradition at Afest. Aptly named, they are sweet little notes received from various tribe members who have noticed something special about you. “Sugar cubes” are a way to tell someone they’ve made a difference. To acknowledge positive attributes. There is something profoundly satisfying to know that the way I intend to BE is the way others see me. So as I sit reading these sweet little notes, I am filled with gratitude for this Afest tribe. For the opportunity to experience them in person all over again. Afest is an integral part of me and what I do in my line of work. I too am a part of them. 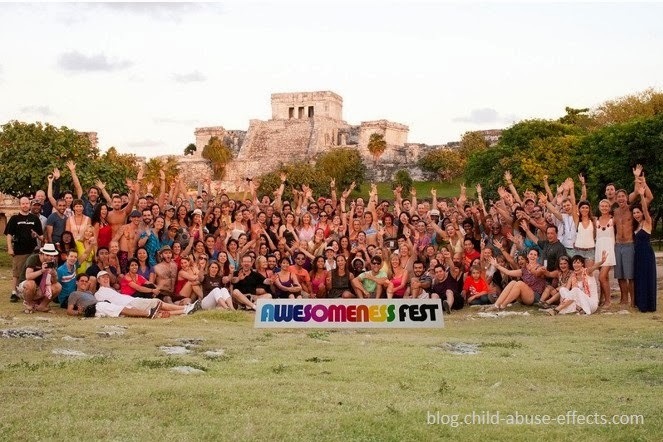 I am weaved into the fabric of what Awesomeness Fest strives to achieve: a unique opportunity to change the world. In my own way. How AWESOME is that! So the question now is, what are you waiting for? TELL someone something wonderful about Who They Are. Then watch the way it changes their world. And yours too. Great idea. I will give it a try. I know I like to hear nice things about myself. It's just an incredibly beautiful idea, in order to look at yourself from outside and see your mistakes.